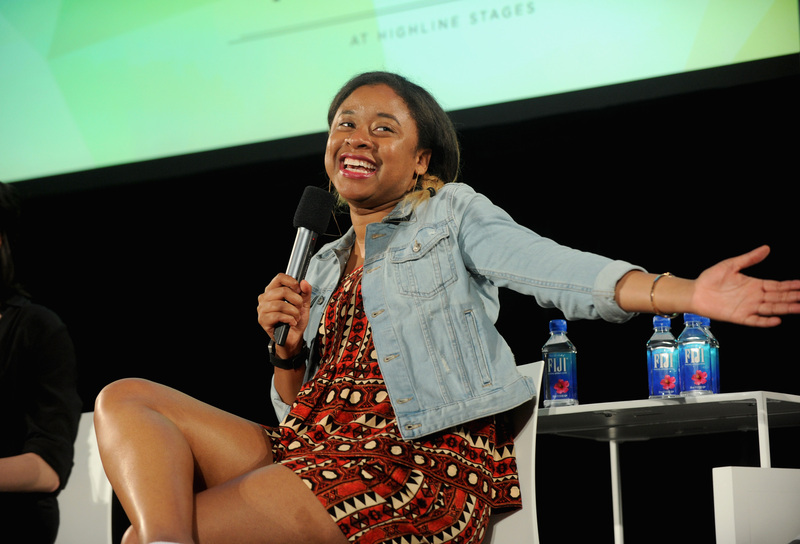 During WNYC's women's podcasting festival, Werk It, on Wednesday, 2 Dope Queens co-host and stand up comic Phoebe Robinson announced an exciting new podcast project. Taking its premise and title from the ridiculousness of how overwhelmingly white and male the comedy space is, Sooo Many White Guys seeks to exclusively interview women, people of color, and the LGBTQ community. Oh, except for the last episode of the season, which — you guessed it — will include a "token white guy" as the interviewee. Get ready for a summer full of Robinson's voice in your ear, because this podcast is not one to be missed by anyone, but especially not by women. On top of that already promising premise, the show will feature Broad City star and comedian Ilana Glazer. Robinson told reporters at the June 15 recording of 2 Dope Queens at the Werk It festival (which you can stream here) in New York that Glazer "plays a crazy producer" with "terrible ideas." Does this get any better? Apparently the answer to that question is a resounding yes, because planned guests include talk show host Samantha Bee, transgender rights activist Janet Mock, and '90s heartthrob Nia Long. And that's just who we know about so far. Robinson told reporters that the idea came to her after witnessing the (not so subtle) thread of misogyny present in the New York comedy scene, like when she recalled this vulgar introduction of her set: "Do you guys like p*ssy? Because our next guest has one!" She's witnessed firsthand how comedy shows often skew to one particular type of performer, and treat others as subsidiary. She said that show lineups usually include an over saturation of "white dudes" with only "one female" or "one person of color," and she wanted to flip that. The podcast is named after a show that Robinson used to headline at Riot LA, where she put together a lineup of people who were decidedly "not white guys." When she realized that comedy shows and events are not only negligent, but disrespectful to anyone who doesn't fall under the umbrella of "straight white male" (see anecdote above), Robinson wanted to give other types of performers the kind of voice they deserve. "People should be as obsessed with them as I am," she told reporters of her non-white-guy comic peers. Thus, "So Many White Guys" the stand-up show was born. Only after it came out did Robinson realize that this brilliant idea could also work in an interview format. Enter the podcast platform, and cue the slow cap. Sooo Many White Guys will premiere July 12 and run through the summer. And, if you can't get enough of Robinson (I don't blame you), check out her other WNYC podcast 2 Dope Queens, with co-host Jessica Williams, when it returns for its second season in the fall.